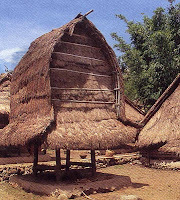 At the weaving village of Sukarara or Penujak, where the distinctive Lombok pottery is strawfired in the backyards of houses, the same basic architecture can be seen, albeit in a less traditional setting than the villages. But this is probably the perfect compromise, where the villagers are discovering a trade that can help them better their standard of living while preserving their cultural values. The hotels in Lombok may be uncertain about what “style” the want to adopt, but they are often well sited to take advantage of the natural landscape, often resulting is sweeping views from the hotel verandahs and balconies. The Puri Bunga Cottages while rather non-descript in its architecture, hugs the hill-side to give every individual cottage a breathtaking view of the Senggigi bay and the Lombok sunset. From the beach front resorts such as the Intan Laguna and the Sheraton, one can see, on a clear morning, the peak of Gunung Agung on Bali as well as a chance to watch local fishermen returning with their daily catch. Slightly further down at Tanjong Aan, the view gets better. The natural landscape here is near-perfect for development of resorts, and it should not be very long before Tanjung Aan becomes a clone of Bali’s Nusa Dua. One can only hope that the distinctive architecture of the Sasak villages would not be banished into oblivion.